← Deward J. Houck, Esq. Company: Norton, Sheehy & Higgins, P.C. 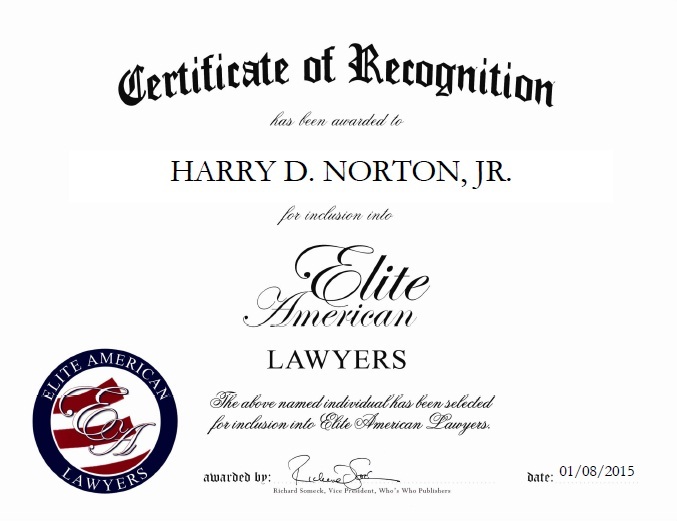 WOODLAND PARK, NJ, February 19, 2015, Harry D. Norton, Jr., Attorney at Law serving Norton, Sheehy & Higgins, P.C., has been recognized by Elite American Lawyers for dedication, achievements, and leadership in litigation and personal injury law. Mr. Norton has spent more than 35 years in the legal field, and over the course of a successful career in law, he has made a name for himself by forging new paths in the areas of insurance defense work, personal injury law, and civil rights defense. He is committed to providing quality comprehensive legal services to his clients, which includes support in employment defense litigation, and insurance defense. Through the years, Mr. Norton has garnered a reputation of distinction and prominence for his exemplary skills and client-focus, which has earned him the respect of his professional peers and legal organizations from across the nation. He was listed as an AV Preeminent Attorney, and he was also named as a Super Lawyer; Mr. Norton is also the recipient of a Lawyer Achievement Award, as granted by the Bergen County Bar Foundation. Mr. Norton opened the firm Norton, Sheehy & Higgins, P.C. in 1982. He currently speaks at presentations and lectures around the world. He remains abreast of trends and developments in the legal field as a member of the Bergen County Bar Association, the Passaic County Bar Association, the Passaic County Ethics Committee, NJDA, DRI, and the Supreme County Ethics Committee. This entry was posted in Insurance Law, Litigation, Personal Injury and tagged civil rights defense, employment defense litigation. Bookmark the permalink.